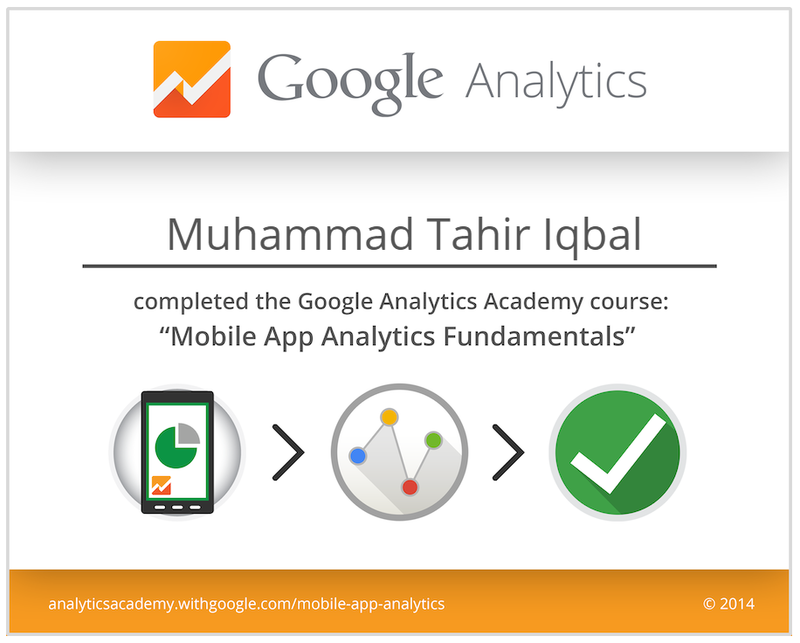 Google Mobile App Analytics Fundamentals Course Completed. It's easy but helped in revising important concepts such as Re-marketing, Segmentation, Event Tracking, AdMob, Monetizing, Advertising mobile apps etc. 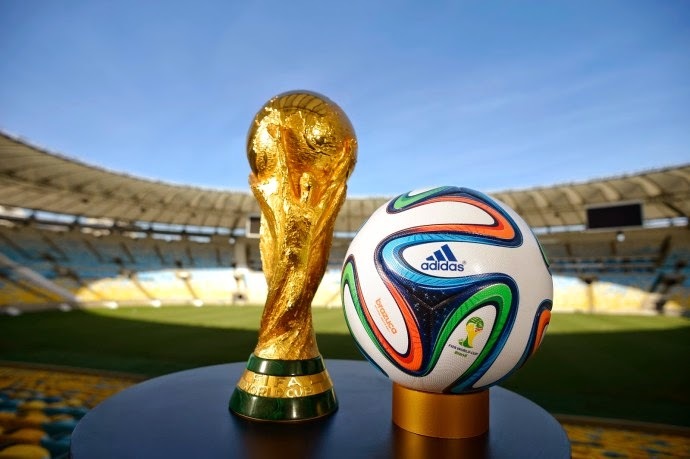 The 2014 World Cup will be one of the most talked-about sports events in history, providing marketers with an unprecedented opportunity for global brand engagement. Watch FIFA World Cup 2014 Matches Online - It's FREE! Watch FIFA world cup 2014 online. Live streaming of all football matches from ESPN live for all football lovers. See live stream of the first 56 world cup 2014 matches on VABSEO. Free live streaming of World Cup 2014Watch this summer's football festival online! Watch Here! Click on (x) to close the irritating ads. Bookmark this page to follow all matches of world cup 2014. Share with your friends and watch all football matches of FIFA World Cup 2014 here. FIFA WORLD CUP 2014 - WATCH ONLINE! Hi everyone, it's been a while since I posted here. Today I am going to introduce my latest work to you. Currently I am working for a major tire distributor, exporter and manufacturer of tires/tyres in UAE. My job is to develop their ECommerce portal for retail division ZDEGREE. It's first of its kind website in middle east where you can buy tires online and schedule appointments for your car repair needs, get tyre and battery replacement service at your doorstep across United Arab Emirates. ZDEGREE Tire & Auto Services company offers state-of-the-art service centers located at 4 different locations in Dubai, UAE. including wheel alignment, oil change, car wash, car window tinting, car detailing, car brakes, car battery, electrical or mechanical repair, car ac service and others. They also offer service of collecting your vehicle, repair and return at your place. 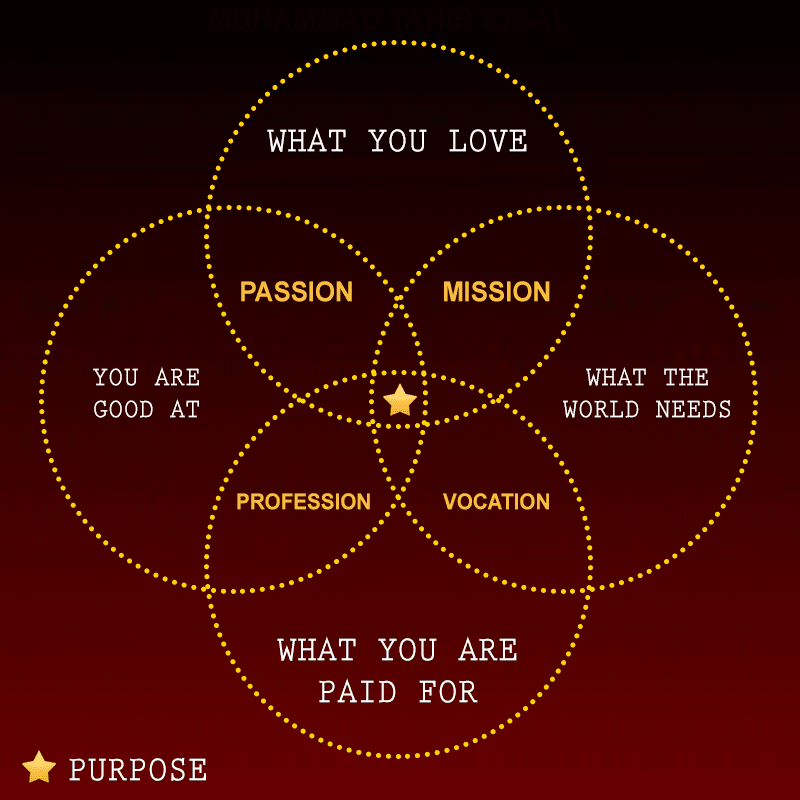 A simple diagram to demonstrate purpose of life. Just as expected, the iPhone 5S looks the same on the outside, has a number of changes on the inside where pretty much all the work has gone. 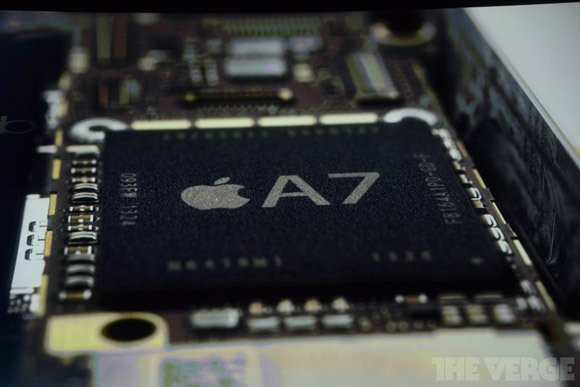 The iPhone 5S makes use of a radically re-engineered new chip set, called A7. Based on 64-bit architecture for the first time, the new iPhone 5S is said to be up to 56 times faster than the original iPhone. iOS 7 is now a 64-bit OS, but it's backward compatible with all the currently available 32-bit apps. The A7 also supports OpenGL ES 3.0, which opens the door to even higher-quality graphics, allowing for real-time computation of effects such as depth of field, blur, full screen vignettes and lens flares. The processor is accompanied by the M7, a motion co-processor, which measures motion data continuously from the accelerometer, gyroscope, and compass, enabling a new generation of sports apps. The new camera has a wider f/2.2 aperture (as opposed to f/2.4) and a larger image sensor. There is also a new double LED flash on the iPhone 5S, which Apple has dubbed True Tone, called this way because it allows to achieve more accurate colors tone. The camera also comes with new image stabilization, albeit digital one. 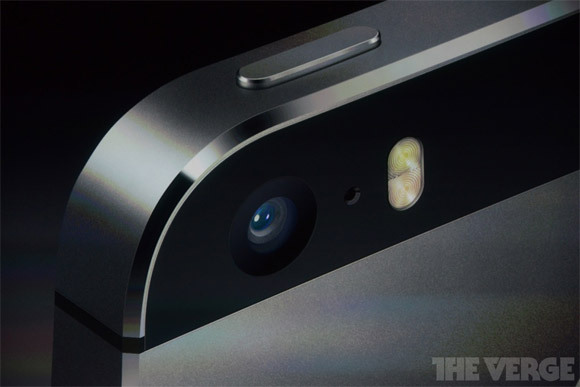 The camera will also captures 720p videos at 120fps, allowing it to create slow-mo videos. As rumors suggested, the new iPhone 5S will indeed sport a touch sensor embedded into the Home button. It's a security feature and it's called Touch ID. A metallic ring around the sensor detects a present of a finger even without pressing anything. 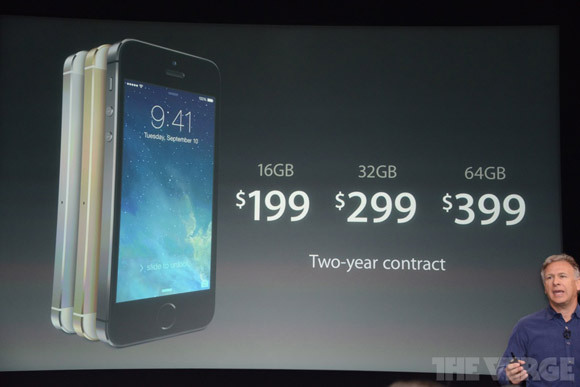 The iPhone 5S will offer 10 hours of 3G talk time, up to 250h of standby, up to 40h of music playback. 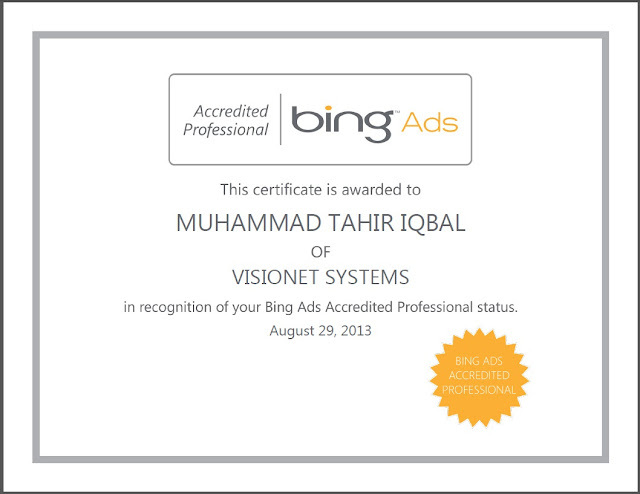 Today I've passed Bing Ads Accredited Professional exam! 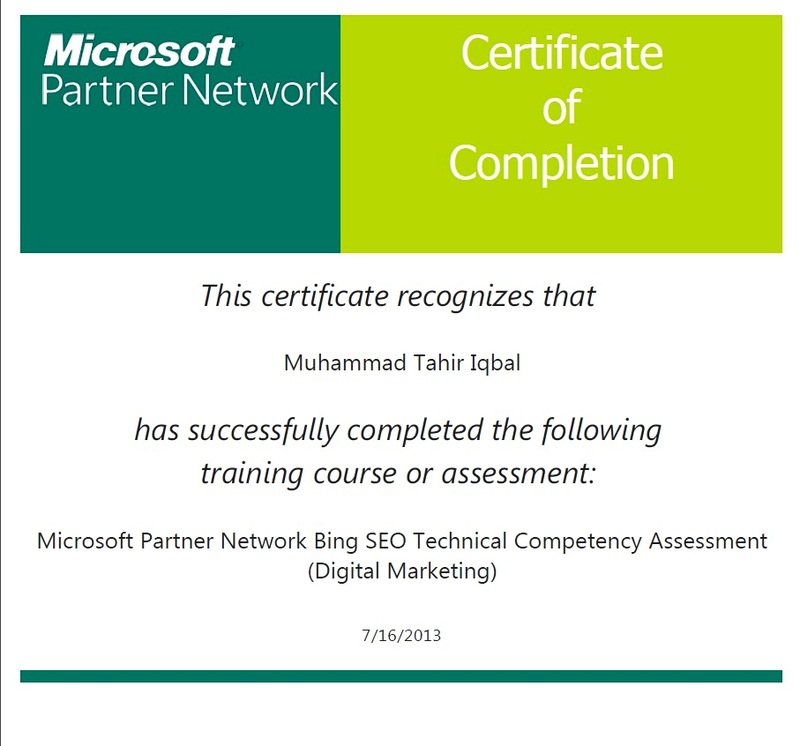 Happy to share my updated Digital Marketing skills certified from Microsoft. 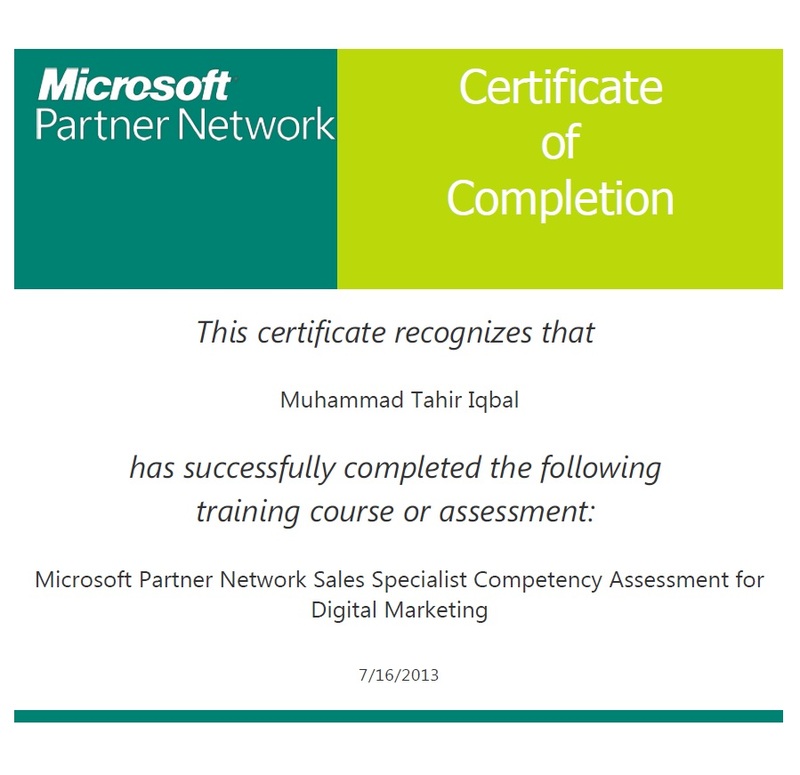 Today I've completed two digital marketing courses offered to Microsoft Partner Network. This Microsoft certification assessed my skills for the sales & marketing particularly the digital marketing competency. This Microsoft certification assessed my skills for the SEO (Search Engine Optimization) particularly the Bing and Yahoo organic search competency. 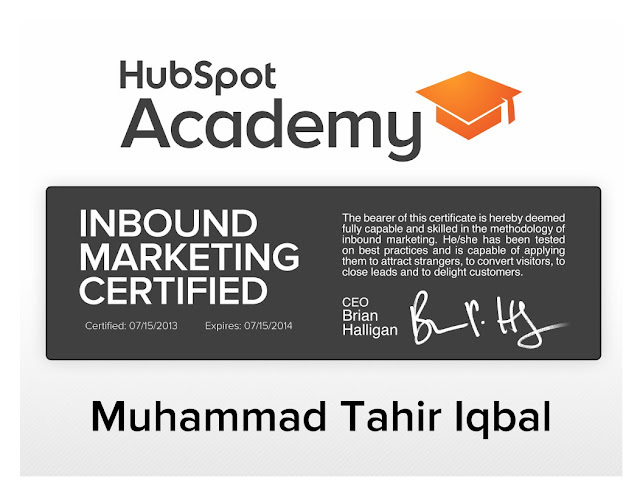 Passed HubSpot Inbound Marketing certification. Recently I've seen a puzzle named Eye Test getting popular on Linkedin. Its quality was not that good, but people tend to share it again and again. 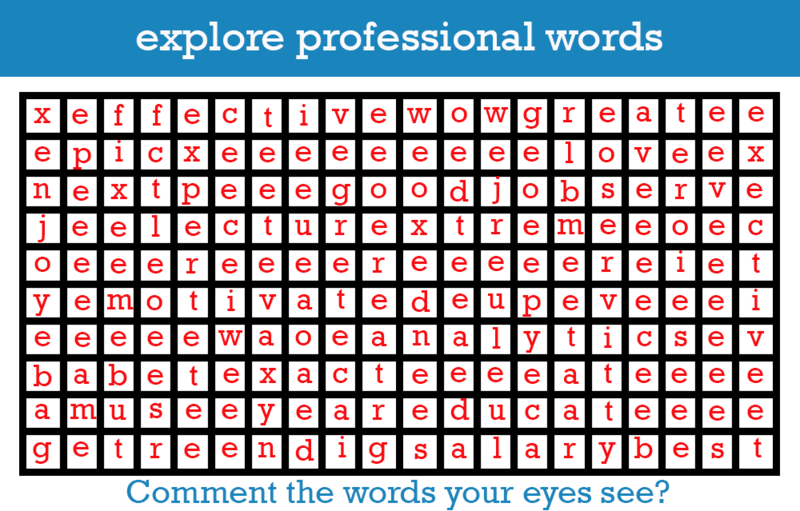 Here's a puzzle containing professional words you can explore. Comment the words you could discover. View Muhammad Tahir Iqbal - ECommerce Executive's profile Marketing minded thinker, doer and deliverer. Planning and execution of online marketing strategies, social media marketing and PPC advertising. ECommerce optimization for more profitability through online channels. For free Search Engine Optimization advice. Dial +971 0529789941 SEO Blog | VABSEO. Simple theme. Powered by Blogger.